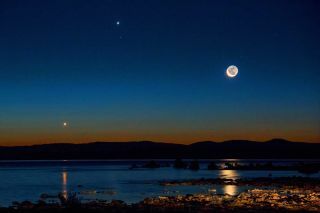 Morning twilight photo of the waning crescent moon shining over the waters of California's Mono Lake, with Jupiter nearby in the upper middle of the photo and Venus at lower left. The photo was captured on Aug. 23, 2014. Some crafty celestial sleuthing has helped astronomers identify the "star" that inspired Lord Byron's famous poem "Childe Harold's Pilgrimage." Astronomer Donald Olson, a physics professor at Texas State University, found that the star Byron describes in his poem as being next to the moon is not actually a star at all. Rather, it's the biggest planet in the solar system: Jupiter. Using Byron's personal letters and manuscripts, as well as the diary of the poet's close friend John Cam Hobhouse, Olson found that the inspiration for three stanzas of "Childe Harold's Pilgrimage" could be attributed to a memorable twilight Byron observed while riding along the Brenta Canal in La Mira, Italy, on Aug. 20, 1817. Olson confirmed his findings using special astronomical software to re-create the twilight sky as it would have appeared on that day in 1817, the date recorded in Hobhouse's diary entry following a ride along the canal at twilight with Byron. The re-creation shows that Jupiter shone brightly near the moon on that night 200 years ago. But Olson's detective work didn't end there. Byron mentions "Dian's crest" in his poem, which is "a clear reference to Diana, the Roman goddess of the moon, who was often depicted with a crescent as a diadem or crest over her forehead," according to the statement. Based on the astronomical re-creations, that's exactly what Byron and Hobhouse would have seen: a waxing gibbous moon with the planet Jupiter shining brightly nearby. What's more, Byron references "Iris" in a line of the poem about the colorful, cloudless twilight sky observed on that night in August 1817. In Greek mythology, Iris is the goddess of the rainbow. Olson determined that the vivid colors of the sky Byron described were likely the residual effect of the massive 1815 eruption of Mount Tambora in Indonesia, the most powerful volcanic eruption in recorded history, according to the statement. The dust, gas and aerosols ejected into the upper atmosphere by the volcano would have had a lasting impact on the sky, creating brightly colored sunsets and twilights. Olson's findings were published in the August 2017 issue of Sky & Telescope magazine. Skywatchers can expect to see Jupiter line up near the moon again on June 30, July 1, July 28 and 29, and August 24 and 25 of 2017.